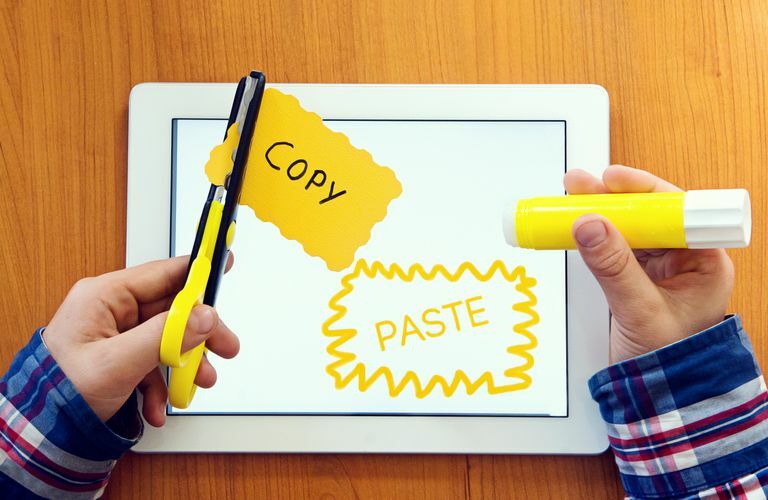 The idea of copying (or cutting) text to an imaginary clipboard and pasting it into a text document has been around for almost as long as word processors. In fact, it is not dissimilar to what editors did before computers, only now we don't use glue to paste a piece of paper onto another piece of paper. And while our computers have turned to tablets, the idea of copying and pasting remains. So how to do it without a mouse and keyboard? With your fingers, of course. In order to copy text to the clipboard, you will first need to select the text. This is normally accomplished by holding the tip of your finger on the text you want to select. Initially, this may bring up a magnifying glass lens that shows a zoomed-in look at the text under your finger. Lift your finger, and the selection menu will appear. The selection menu includes the ability to cut (which deletes the text when you copy it to the clipboard), copy (which doesn't delete the text) and paste (which will delete any text selected and replace it with what is on the clipboard). In some apps, you will also get options such as the ability to insert a photo or define a word. If you are using a text editor or word processor, the text under your finger will not become highlighted. This allows you to move the cursor around the text, which will let you move up a paragraph to correct a mistake or insert a new sentence. In order to begin selecting text in an editor, you will need to tap "select" from the select menu. If you aren't in an editor, the word you are touching will automatically highlight. If you are in the Safari web browser, you can double-tap a word to select it and bring up the selection menu. This also works as a shortcut in some other apps. You can highlight more text by moving the blue circles surrounding the selected text. The selected text will be highlighted blue with the circles at each end of the text. You can move a circle up or down to select an entire line of text at a time, or you can move it left or right to fine-tune your selection. Once you have the text selected, tap cut or copy to move the text to the clipboard. Remember, if you choose Cut, the selected text will be deleted. If you want to move a selection of text from one section to another section, Cut is the best option. If you simply want to duplicate the text, Copy is your best bet. Now that you have a selection of text on the clipboard, it's time to use it. Remember, there isn't a real clipboard, so you don't have to go anywhere on the iPad to access it. The clipboard is just a bit of memory reserved for the iPad to hold your text while you are using it. Before we paste the text, we first need to tell the iPad where we want it to go. This is the same as step one: tap and hold your finger on the area of the document where you want to paste. This brings up the magnifying glass lens, which will let you choose the exact spot for the text. When you are ready, lift your finger to bring up the selection menu and tap the Paste button. If you want to replace a section of text, you should first highlight the text. This is step two. After the text is highlighted, tap the Paste button to replace the highlighted text with the text on the clipboard. Tap and hold to bring up the cursor selection, and then lift your finger to bring up the selection menu. Use the blue circles to help select the text you want to copy to the clipboard. Choose Copy to simply duplicate the text and choose Cut to move the text, which will delete the selected text in preparation of it being pasted elsewhere in the document. Tap and hold to bring up the cursor selection, moving your finger until the cursor is at the spot you want to paste the text before lifting your finger and tapping the Paste button.